Extreame Savings Item! Save 49% on the Hosley 3'' High Pillar Candles, Set of 6. White, Unscented. Bulk Buy, Using a Wax Blend. Ideal for Wedding, Emergency Lanterns, Spa, Aromatherapy, Party, Reiki, Candle Gardens O4 by Hosley at Home Decor Outlet Store. MPN: FBA-G08902ON-1-EA. Hurry! Limited time offer. Offer valid only while supplies last. Hosley's Set of 6, 3'' High White Flat Top Pressed Unscented Pillar Candle. Great for Weddings, Parties, Special Events and Emergency Lighting. 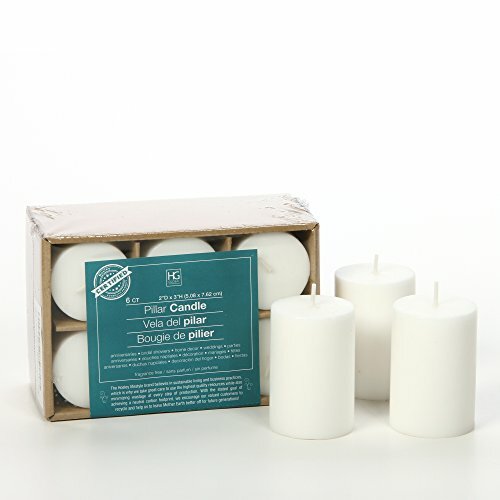 Hosley's Set of 6, 3'' High White Flat Top Pressed Unscented Pillar Candle. Great for Weddings, Parties, Special Events and Emergency Lighting. Always trim wick to 1/8" prior to each use for optimal performance. Always use on heat/flame resistant surface and burn within sight. Keep away from things that can catch fire and away from children and pets.